An already short summer curtailed by a few more days. Two stars prematurely heading into retirement. A trip across the Atlantic Ocean for a pair of regular-season games while the rest of the League was in training camp. Injuries. The Anaheim Ducks have played through all of those hardships with a giant target on their back in the shape of the Stanley Cup. No, but defending a championship never is. No, and that’s the best thing the Ducks have going for them as they prepare for their first postseason since winning the franchise’s first Stanley Cup. Despite all the hiccups along the way, the Ducks are not far from the pace they set last season, when they finished second in the Western Conference and sped right through to the Stanley Cup Final, where they dispatched Ottawa in five games. An optimist would say maybe these Ducks are better prepared to defend their Cup as a result of their season of uncertainty and adversity. “We haven’t used anything for a crutch,” Ducks coach Randy Carlyle said. “We’ve faced all the adversity that we’ve been dealt. All of the challenges, we felt we’d meet them head on. We’ve met them head on, but have we been as good or consistent as we’d like to be? No, we haven’t, but we’ve shown flashes and we think we have the ability with this group to elevate our execution level. Anaheim has parried that attack in the late stages of this season, climbing the standings and playing its best hockey since last year’s playoffs. Things haven’t always been that way this season. The Ducks’ offseason began in jubilation but quickly turned to uncertainty with the questionable status of defenseman Scott Niedermayer and forward Teemu Selanne, a pair of future Hall of Famers who were contemplating retirement. Niedermayer and Selanne hadn’t made up their minds at the start of the free-agent frenzy July 1, forcing GM Brian Burke to fill their positions. He secured a pair of veterans in defenseman Mathieu Schneider and forward Todd Bertuzzi, but all anybody could think about was the loss of the two stars. In the midst of the free-agency period, the Ducks were hit hard again when Edmonton GM Kevin Lowe tendered a multi-year, multi-million-dollar offer sheet to Dustin Penner, who was a restricted free agent. The Ducks didn’t match the offer, and Penner became an Oiler. Now Anaheim was without three key components of its Cup-winning team. Before the Ducks knew it, they were en route to London for a two-game series against Los Angeles beginning Sept. 29 to kick off the regular season. The trip was pre-planned and the Ducks were honored to represent the League, but the fact remained that it hadn’t even been four months since they had lifted the Cup at the Honda Center. “You want to tell yourself it’s no big deal and it’s all mental, but that London trip was a tough thing to do,” defenseman Sean O’Donnell said. What made it even tougher was the return to North America and a head-long dive into the regular-season that featured a three-city road swing with stops in Detroit, Columbus and Pittsburgh before the Ducks finally returned home to open their own building, Oct. 10. By the end of October, the defending champs were 4-7-2, barely staying above water in what already was becoming a tight Western Conference race. Fault aside, the Ducks had a lot to overcome after just one month. 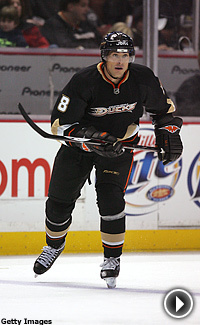 Anaheim Ducks center, Ryan Getzlaf, leads the team in points and assists. On Dec. 5, that group got better when one of its lost leaders, Niedermayer, announced he would return. 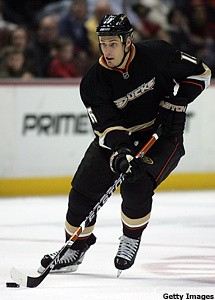 Eleven days later, Niedermayer played his first game of the season and the Ducks sat at 15-15-4. Then, the club won 12 of its next 19 games before the All-Star break. The day after the All-Star Game in Atlanta, Selanne announced he was coming back, too. By Feb. 5, the night Selanne debuted in Long Island, all the Ducks were back in a row and ready to take flight. With Selanne and Niedermayer joining Pronger, Getzlaf, Schneider, Bertuzzi, Corey Perry, Jean-Sebastien Giguere and the rest of the team, the Ducks won 11 of their next 12 games, moving to within four points of Dallas for the Pacific Division lead. Then, on March 6, Perry was victimized by Colorado goalie Jose Theodore’s skate blade, which partially severed a tendon in his right quadriceps. The injury should shelve Perry until at least the second round of the playoffs – should the Ducks get that far. It’s not. Perry is Anaheim’s leading goal scorer on a team with just 187 goals, the fourth-fewest in the League. However, if this season has taught the Ducks anything, it’s how to persevere through adversity, no matter how much is heaved in their direction.